The tragic events in Odessa, where neo-Nazi militants have burned alive at least 50 people, are already being called a new Khatyn. The parallels are so striking that this image instantly infiltrated the world’s consciousness. And the same perpetrators were responsible. The residents of Khatyn were incinerated by the 118th Nazi police battalion, made up of mostly Ukrainian military personnel from the Nachtigall and Roland police battalions under Abwehr command that were originally created with the assistance of Stepan Bandera. At the beginning of the war, Nachtigall was led by Roman Shukhevych, who later assigned his thugs to a new punitive unit. The residents of Odessa were killed in a fire set by a new generation of fascists who roam the streets of Ukrainian cities clutching portraits of Bandera and Shukhevych. 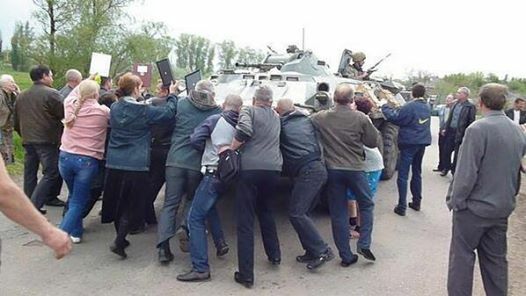 Residents of Kramatorsk (Donetsk Republic) trying to stop a Ukrainian pro-junta National Guard armoured vehicle, May 2, 2014. The Khatyn massacre in Odessa has created a new reality, in which Ukrainian citizens, whose only goal is to defend their language, way of life, and values, stand in opposition to the neo-Nazi junta in their own capital of Kiev. Unlike the Donbass, where there is an armed militia, the protests in Odessa were entirely peaceful. But the Rubicon was crossed in Odessa on May 2. The taboo against the killing of peaceful civilians by armed militants no longer exists. It is no coincidence that a few hours after the tragedy in Odessa, the National Guard began ruthlessly shooting the residents of Kramatorsk who were attempting to block armored vehicles by standing in their path. It’s possible that many of them did not even know what had happened in Odessa where their fellow Ukrainian citizens had been set ablaze right in front of the indifferent police forces while the neo-Nazis shouted, “Burn, Russians!” and “Death to the damn Russians!” and that those who escaped the fire were finished off with axes and clubs, all to the tune of the Ukrainian national anthem – a song that will now always be associated with the Khatyn in Odessa. 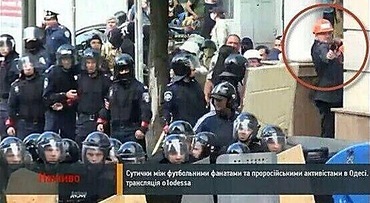 The latest information about the tragedy indicates that on May 2, the leaders of the junta staged a provocation and consequent punitive action against the citizens of Odessa, in order to reduce or utterly destroy the spirit of unrest there that could potentially lead to open resistance to the Banderite regime, as it had in Donetsk, Lugansk, and Slavyansk. With this goal, fighters from the special task force Vostok (East) and Storm battalions, sponsored by Ukrainian multi-billionaire Ihor Kolomoysky, were brought into the city dressed in civilian garb. The so-called “14th company of Euromaidan Self-Defense Force” from Kiev, which had been actively involved in the riots in that city on April 29, was also involved. Anti-fascist tent camp on Kulikovo Field, Odessa, April 2014. 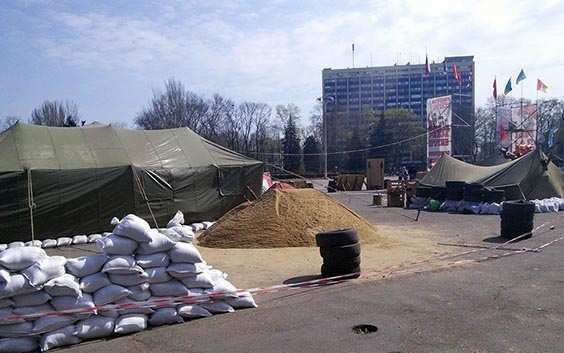 The tent camp of the Odessa residents opposing new illegal Ukrainian administration was gathered in the center of city in late February 2014 immediately after the coup d’état in Kiev. Over the next months dozens of thousands of citizens used to rally here in a desperate attempt to protect their basic rights and freedoms in emerging nationalistic Ukraine. On May 2, 2014 the local soccer club FC Chernomorets Odessa hosted FC Metallist from Kharkov in a regular match of the Ukrainian league. Crowds of soccer fans from Kharkov arrived to Odessa and were moving to the stadium. Suddenly they were attacked by unidentified masked gunmen wearing St. George ribbons (symbol of antifascist resistance to Kievan junta!!!) and red arm-bands. 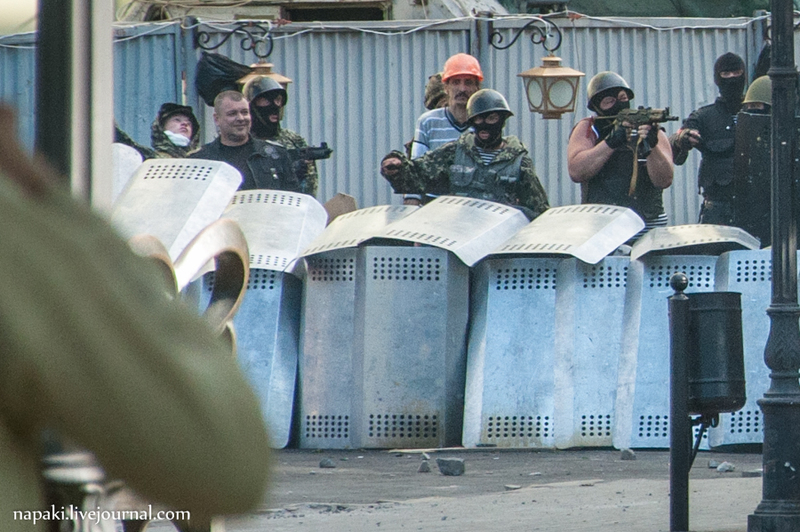 The same arm-bands were noted on the sleeves of some of the Ukrainian policemen. Strange combination of contradicting identifications (St.George ribbon and Ukrainian flag) on the bulletproof vest of a fighter on the street of Odessa. Take note of the red band. 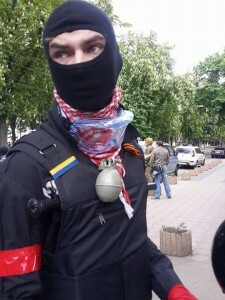 Masked gunmen wearing St.George ribbons (!) 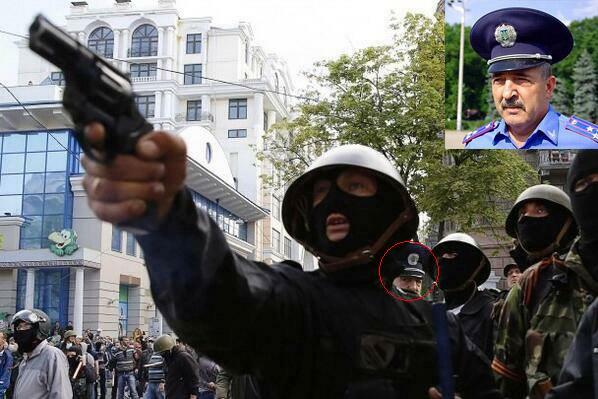 are coordinated by local police deputy commander Dmitry Fucheji (in the red circle and embedded photo). A group of men with red bands receive instructions from a person in police uniform, Odessa, May 2, 2014. Masked gunmen are calmly walking by the local police officers. Gunmen shooting at the football fans. Odessa police pays no attention to man shooting at the football fans. No wonder that the infuriated fans immediately moved in trying to reach the assailants. They crushed everything on their way. After a short “resistance” police pulls back and lets the furious crowd to Kulikovo field, the base of peaceful anti-fascist protest in Odessa. At that point football fans were joined by the ultranationalist Right Sector thugs who surrended the Trade Unions building, where the majority of anti-fascist protesters escaped, rushed in killing everyone on their way and then setting the building on fire by the Molotov cocktails. As a result, during the clashes and the fire at the House of Trade Unions, at least 116 people were killed and over 200 were injured and crippled, more than 20 are in critical condition. Eight people died after leaping from the upper floors of the building. There are latest reports that the thugs used a toxic gas to neutralize people inside the building. A shocking photo report on atrocities committed by the Right Sector inside the Trade Unions House is available here (Caution: strictly 18+). The victims who survived and were pulled from the blaze were killed on the spot and then photographed against a backdrop of burned corpses with signs reading, “This is Ukraine.” The worst of the shocking footage out of Odessa is not even the photos of the charred corpses in the House of Trade Unions, but rather the video of frenzied neofascists hacking off a young man’s leg right in the middle of the street (9:00 onwards). They did not hide their pleasure at the sound of the victim’s screams and the crunch of bones, as they slathered their hands in his blood with cries of exultation. These are no longer human beings, these are NON-HUMANS. Yes, if “Ukraine” now consists of animals like this, then the country it once was truly no longer exists. It is already clear that the junta has failed to achieve its goals. 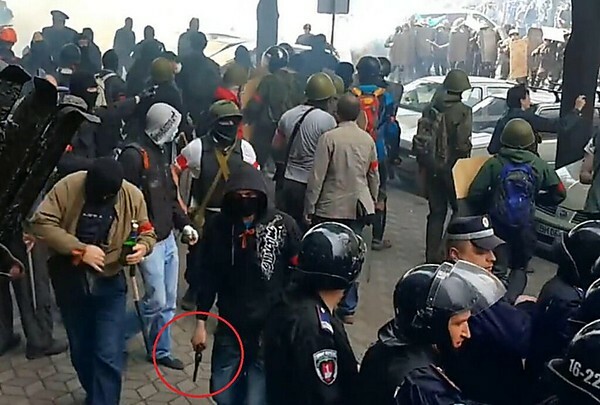 The citizens of Odessa have now decided to move from peaceful protests to guerrilla attacks. And they are right to do so – the residents of the occupied territories have no other way to prove anything to the fascists there – this was true even during WWII. 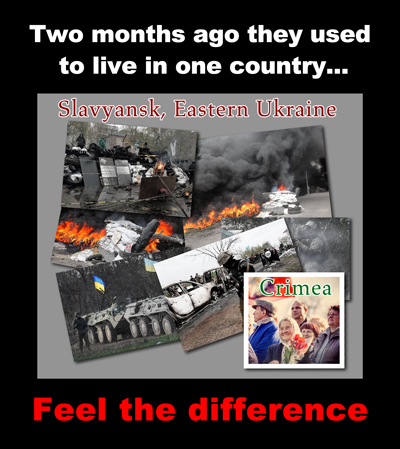 Instead of extinguishing the flames of this smoldering civil war in Ukraine, the junta has thrown gasoline on it. The supporters of a federalized country have been incinerated – beyond this brink there is no longer any possibility of Ukraine continuing to exist within its current borders. Of course the West is interested in establishing a neo-Nazi Ukrainian state on the border with Russia. The only question is about the perimeters of this state, and this involves more than just its boundary with Russia, since obviously neither the Romanians, Hungarians, or Poles will be pleased to find themselves saddled with such a neighbor. What conclusions can be drawn after the tragedy in Odessa? First, the provocation committed by the Right Sector-linked gunmen with the red arm-bands agaisnt visiting football fans was carried out with the assistance of local police, loyal to Kievan authorities. Second, there can no longer be any question about whether the people of Crimea made the correct decision about reuniting with Russia. Several million people there were given a promise of security, prosperity, and a clear, straightforward, and comprehensible vision of their new lives as Russian citizens. Third, the Southeast will never consent to living under a single government with fascists. The flames in Odessa signaled the cremation of not only the Geneva Agreement, but also the idea of federalizing the country of Ukraine. Fourth, the decision made by the leaders of the Donetsk People’s Republic to go ahead and distribute weapons to the public in advance can now been seen as entirely sound, because the junta in Odessa has shown it has no intension of conducting any sort of dialog with the southeastern regions, and that it is ready to kill and burn anyone who thinks differently. Fifth, the leaders in Russia now have the option of postponing all decisions about whether to deploy troops to rescue the ethnic Russians there, since the militia forces are now able to manage the junta’s troops on their own. Russia’s task will be to provide humanitarian assistance to the southeastern regions of Novorossiya, where there will be great need, given the widespread hunger and destruction. Sixth, any presidential election would be out of the question amidst this civil war in Ukraine. Thus, the junta cannot hope for any sort of legitimacy after May 25, despite all the speeches made by Obama and Merkel. On the same day we saw a demonstration of exactly how Russians differ from those who call themselves Ukrainians. Ethnic Russians in Lugansk shot down one of the junta’s helicopters, but the Ukrainian soldiers who responded to its distress signal from the wounded pilot arrived just to take his gun and leave him to die! It was the local Russian-speaking militia forces who took him to the local hospital, where doctors saved the life of the very man who was about to kill them. I have been following Soviet/Russian foreign policy for the last forty years so I send you my opinion about the current Ukrainian crisis for what it may be worth. The people of western Europe are fairly evenly divided about who is to blame, but the governments and the press are very anti-Russian even though they know of course who started this crisis. On the other hand many independent analysts and common people acknowledge the russian point of view. You must realize that the western governments and the press practically hates Russia because they cannot dominate it and so they take every opportunity to attack you economically. They do not need any excuse to impose sanctions (other than Krym), they will impose sanctions whatever you do. From their point of view this stance is logical although it is very irrational in reality. The cost for Russia for doing nothing in the Ukrainian crisis is great (and the gains are minimal). But the cost for a russian intervention to save the Southeast from the fascists i Kiev is not greater and in this case the gains will be great in stead. The west prefers a weak Russia that they can despise and ignore, rather than a strong Russia that they fear and have to consider. They only understand the language of power. Which Russia do you want to be? At the same time there is a growing understanding by the people in western Europe for the neccessity of division of Ukraina because of the latest events, even a division by russian intervention. There is a sentiment or preparedness to accept a russian intervention, in the minds of the people both in the west, in Ukraine and in Russia, in large part because of the massacres i Odessa and Mariupol. This is the best opportunity to take back controll over Russian lands outside of Russia. The west will never allow the federalization and neutrality of Ukraine only because that is what Russia would like. The west will break any treaty about Ukraine not joining NATO or being neutral. You cannot trust them. They will deploy NATO-troops in Ukraine as soon as they can. A Russian intervention in all the southern and eastern parts (and Transniestria) from Odessa, by Dniepropetrovsk, to Charkov is a big operation but it is neccessary. The people are waiting. You must come as a liberator/protector, not for annexation (that can be done later, by referendum). You can use local militia and cossacks to support russian troops. But you must act now when the west is mentally prepared that this will happen and they will not go to war. This opportunity will not come again. The military opposition to russian intervention is very weak right now, but in one year it will be stronger. You don´t need central and western Ukraine, too many fascists live there anyway. Make it clear that you only protect russian-speaking parts and the west cannot act militarily against this. The sanctions from the west will come anyway, whatever you do, so there is nothing more to lose, but 20 million russian-speaking people to win. Remember this is about geo-politics, the west will fool you if they can. 1st. Should Russia try to control the whole of Ukraina or just the southeastern part? To control the whole country means that you have to deal with 20 million people in the northwest that are anti-russian. Also such a control will be costly and insecure, you can lose it in the next “revolution” in Kiev. So better to aim at controlling the southeast where the people are more friendly and where the industry is. 2nd. Should the southeast be part of an Ukranian federation, an independent country or even part of Russia? A federation will have the same problems as today because Kiev(and EU/NATO) will always try to control the whole country. An independent country must have very close cooperation with Russia and be in a military and economic alliance. It can be the first step to unification with Russia. Part of Russia would be the best long-term solution and it could be so after referendum. Then the problem would be permanently solved. 3rd. Where will the border be? The southeast (or Malarossija) must include enough regions to make it worth all the sanctions (they will come anyway). But it should not include too much anti-russian areas so as to make a unification by referendum difficult. I can see two possible borders:The whole of the oblasts of Charkov,Donetsk,Lugansk,Zaporozje,Dnepropetrovsk,Kherson,Nikolajev,Odessa including Transniestria – or, in order to assure pro-russian (even unification) majority, from Charkov to Dnepropetrovsk (or Dneprodzerzjinsk),then follow the Dnepr river to Zaporozje and then from Nikopol straight west to north of Tiraspol (maybe with a bend to include Krivoj Rog). It would give up some territory but have a more comfortable pro-Russian majority. 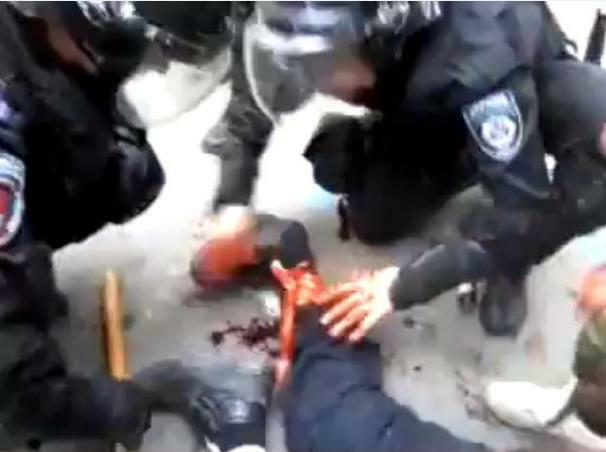 The latest events i Ukraina (the killings in Odessa, Slavjansk, Mariupol) makes it neccessary for Russia to intervene and save the people in the southeastern regions from the unconstitutional fascists in Kiev. In fact it is Russias obligation and right under international law to save ethnic russians and russian-speaking ukrainians in the failed state of Ukraina. You have the power to do so, do you have the will? The west (EU,Usa,Nato) will not go to war to protect the fascists in Kiev so this is a historical opportunity for Russia to liberate russian lands and to solve the Ukrainian problem permanently. But Russia must act NOW! Do not fear the west, they hate you so the will make sanctions whatever you do – so you might as well solve this problem with a humanitatian intervention – but they also want your trade so in two years time it will be business as usual. Russia must help the people in “Novorussia”, that is the oblasts of Odessa, Nikolajev, Kherson, Zaporozje, Dnepropetrovsk, Kharkov, Donetsk and Lugansk – and do not forget the republic of Transdnestria too! If the west thinks Russia is weak they will attack even more, they only understand power and strength, they will try to fool you. You must not act foolish or cowardly, do not betray the people,instead you must help the people in southeastern Ukraina get their independence, they are getting murdered by the fascists while waiting for you! 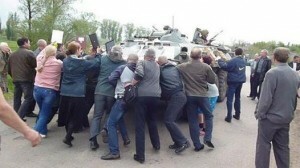 Russia should send strong peacekeeping forces in all southeast now! President Putin said that he would not allow violence against the people of the Southeast, he cannot go back on his word now, especially after the tragic events in Odessa, Slavjansk, Mariupol. No one can object to a Russian humanitarian, peacekeeping intervention in accordance with international law after these events. Civil war has indeed broken out. Russia should keep repeating in all public channels that it intervenes to stop the killing of unarmed civilians according to international law. It is Russias obligation now to save the russianspeaking people of Odessa, Nikolajev, Kherson, Zaporozje, Dnepropetrovsk, Charkov, Donetsk and Lugansk oblasts and Transniestria too, and help them get their independence from Kiev (and from Moldova, respectively). Russia cannot trust the west or Kiev, even if they agree on russian language status, regional autonomy and stopping the attack on Donbass, because they will break every agreement and try to fool Russia if they can. This is a unique opportunity to solve the Ukrainian problem permanently. Russia must not abandon the people of “Novorussia”.You will not evade sanctions but after two years they will be lifted because the west wants your trade, and the problem will have been solved. But you must act quickly. I have even sent a few e-mails to president Putin on the matter, via the presidents site, the last of them was a bit desperate, regrettably. I react very strongly to what is going on (and so does a lot of people in western Europe) – the western governments hypocrisy, the killings of civilians, and in my opinion, the risk of missing this opportunity by Russia to solve the problem permanently. 1.The illegal Kiev “government” is allowed to slowly defeat the Donbass republic and the rest of the Southeast with the help of foreign mercenaries and Pravyj Sektor.This is unlikely because the Donbass republic and the resistance in southeast is growing stronger.Also,president Putin should not allow this to happen as it would mean more massacres of civilians. – Worst scenario and must be avoided at all costs.It means no federalisation,great tragedy and great human losses,loss of face,reputation and influence for Russia,and Nato coming into Ukraina. 2.Status quo,civil war in Donbass,spreading to the rest of southeast.This is probable for a while but it cannot continue indefinetly.It means more civilians killed by Kiev but also more losses for them.If these losses are high,it can force Kiev to negotiate seriously. – This scenario is the most likely in the short term but it cannot last too long.It will change into one of the others, preferably to nr.3. 3.The Donbass republic makes offensive.This is possible as they have the manpower to do so and volunteers from Krym and Russia would like to help. Charkov,Zaporozje,Odessa and Nikolajev would join Donbass and do like them (resistance and referendum). – This scenario is the most preferable.It only requires a bit help with volunteers and weapons and will have the best results at low cost:federalisation,language status, no Nato,enhanced russian influence and world reputation. 4. Russian intervention.Foreign minister Lavrov said (just like president Putin) that Russia has no intention to invade.Based on the current situation it is correct,but the situation can change,especially if there are more tragedies(Odessa/Mariupol). – This scenario is a “last resort” and it should be only insinuated like a possibility for certain circumstances.It should come true if the situation deteriorates dramatically,because this scenario is preferable to the first scenario above. The illegal elections of May 25 will change nothing for the better, just the opposite. Thank you for expressive and straight-forward message. Indeed, very few of the people understanding the situation have the courage to openly support the force on the right side of history. Farce “presidential elections” in Ukraine held last Sunday are not a culmination but a new turn of Ukrainian crisis. Ukrainian people know that the results are not representative but unscrupulously falsified. The fate of Mr.Poroshenko is dire. The Russian military humanitarian intervention in the East is the only option that would save him. Please follow the news from the former Ukraine… and get surprised!